Nobody keeps a secret better than Dave Filoni. Dave is the Executive Producer of Star Wars Rebels and an all-around nice guy. A devoted Star Wars fan, Dave can sling reference quotes with the best of them. Anyone who has met Dave or heard him speak knows that the Star Wars franchise is safe in his hands. But trying to get a secret out of Dave is harder than trying to break into an encrypted iPhone. It’s a running joke at press conferences because Dave gives away so little, but we can be glad he doesn’t. It makes the journey all the better. At the end of Clone Wars fans had to guess at Ahsoka’s fate. 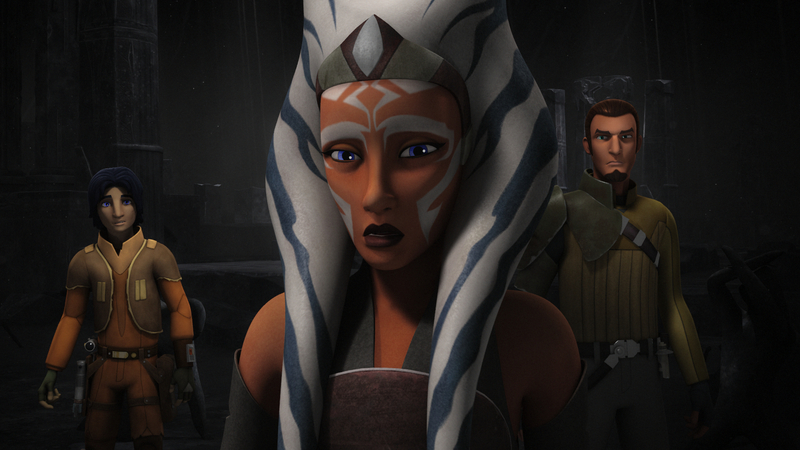 Was this always the destiny you imagined for her character or did that develop as Star Wars Rebels was being defined? 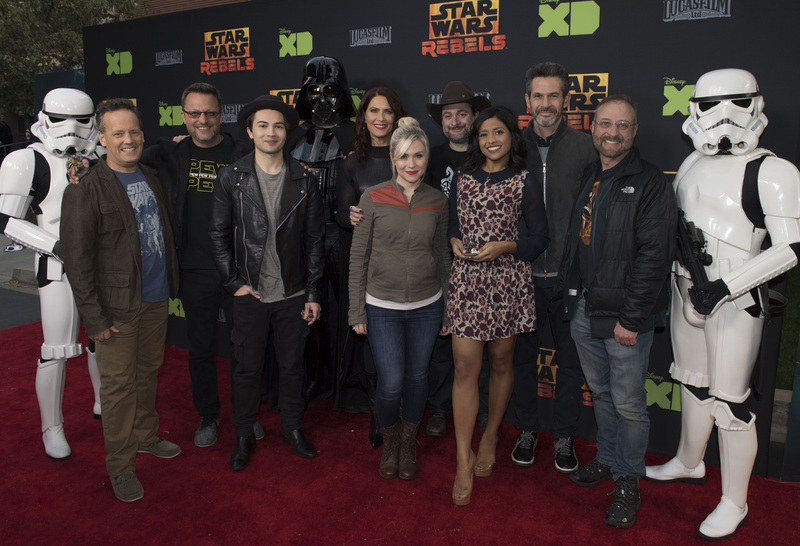 It kind of evolved out of the development of the story of Star Wars Rebels in a couple different ways. One was that I had always pictured and drawn images of Ahsoka confronting Vader. It just seemed like such a tempting thing and that goes back to 2006-07 when we were working on Clone Wars. We had worked on a couple different ideas and I had pitched out different things on how this conflict would go. I actually talked at length with George [Lucas] about it before he was out. I asked him a couple questions about characters and character interactions that I wanted to have some awareness of his thoughts before he moved on. As far as it being in Rebels that was just the opportunity that we had. What necessitated it was really if we wanted to bring Darth Vader into the story in any way we had to have a reason for that. None of us felt that Ezra and Kanan or the crew of The Ghost were a big enough or good enough reason. There was nothing about Ezra and Kanan that you thought an inquisitor shouldn’t just be dispatched to deal with them. But Ahsoka would be a character that you could see a direct need for Darth Vader to get involved and to be interested in them. So we’re telling that story of how those two characters come together, but a lot of it is done from the point of view and perspective of Ezra Bridger which made it worthwhile for Rebels. At the press conference at Star Wars Celebration you promised that every character would be featured during the season and their backstory would get even more fleshed out and you were true to that promise. Which character arc was your favorite? It’s hard to say. For me because I’m so much farther down the track I look at a lot of character arcs and how they’ve developed. I thought Hera had some really nice development this year. Zeb had some great development with [Agent] Kallas and his lessons from Lasat kind of fed into that. 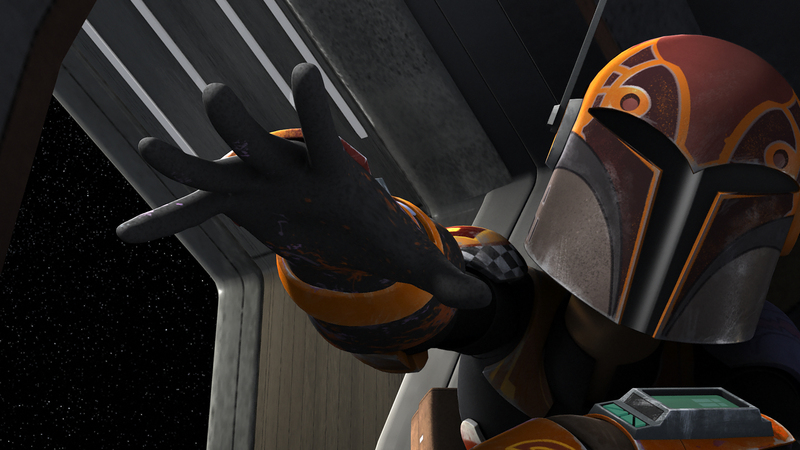 Overall though I really think Sabine will be the character people will see grow the most next to Ezra. She is going to have some tremendous development. We just kind of peeked at that this year, introducing the Mandalorians into the story of Rebels but it’s safe to say we will be seeing more of that – Sabine and Mandalorians – in the future which is really exciting. Ezra’s ability to connect with animals seems to be unique. While Kanan also has that ability, it seems more pronounced with Ezra. Is this because Ezra is more powerful than other Jedi or is it that each Jedi is attuned to the Force in different ways? I think everybody has strengths and weaknesses. I’ve always thought of the Force as everybody has a very similar set of abilities so everyone can kind of communicate with animals or push objects or pull objects but some people have a stronger aptitude for those things. For whatever reason Ezra just has a more natural ability to connect with creatures. I could liken it to dogs like some people more than other people. You meet some people like my wife who’s like a dog whisperer. Any animal she talks to immediately is wagging its tail and going over to her. The Force for me is always a kind of amplification of what we see in real life. It’s not a superpower. It’s just augmenting things we normally do. So when you say, “I sense a presence. A presence I haven’t felt since…” Well, you’ve probably been in a room and you go, “Something feels familiar” then you turn and see somebody you know. These are real things. They’re not as much fantasy, but we portray them in a fantasy way. The ability to push someone away with your anger and force push someone is a direct correlation. That’s how I kind of always thought of it and when we write it we just decided Ezra would be a little more unique in this area. Kind of I think speaks to him being a boy, being a bit more open to the natural environment around him, especially on his planet. 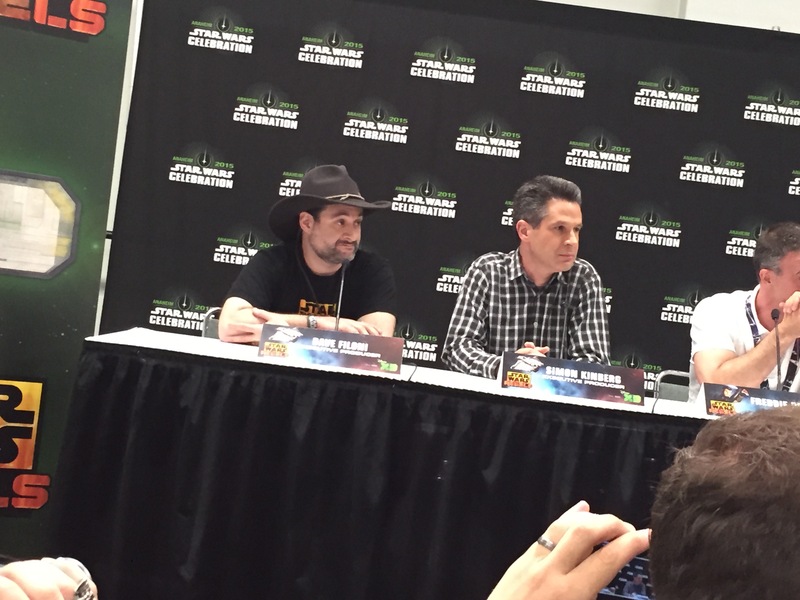 What is the hardest part about being Dave Filoni? What are the challenges you have face because of your unique role with this show and Star Wars in general? Boy I don’t know. I really love what I do. The challenge, the hardest part is really just the limit with time. It’s the same challenge everybody has. Time. Budget. Resources. But I have a great team so I don’t really feel those are very prohibitive anymore…I only have to report I really love what I do…If there’s one hard thing it’s trying to pick which stories are actually going to make it on the screen. Trying to pick and choose between some great ideas that we all come up with. Is it hard not talk about it? Oh yeah! But you can’t. I’ve seen all kinds of things I’m sure you’d love to know. Everybody thinks it’s this great thing if you get to see something in advance or read something in advance. It’s not. You can only talk to about three other people and everybody is whispering so you don’t really know what anyone’s saying. I told the actors because none of them have seen this tonight. They have no idea how it ends, they have no idea what’s going to happen really. They haven’t seen any of the footage. They portrayed the characters but I’ve kept them really blind on this one more than normal, and I told them, “You guys get to go in there tonight and be amazed at what’s going to happen – I hope. And I hope you wonder what happens and it’s exciting and exhilarating.” [But] I know. I’ve known for months. I’ve been working on it trying to make sure it doesn’t stink, watching go from being good to being not good to needing repair to start being good again so now it’s just all done and all I can do is sit back and watch the reaction. Maybe that’s the challenge there. Ezra’s arc seems very similar to Anakin’s – very Force-attuned, but not trained as a child; self-reliant out of necessity; orphaned after entering training in the Force; and being tempted by the Dark Side. Was this meant to be an intentional comparison or something people pick up? I think its similarities people pick up. We never sit there and say we’re going to do this because it happened to that character. I think in a lot of stories there are just commonalities you can’t avoid, especially if you do them the right way. The idea that Anakin would be tempted by the Dark Side or Ezra is what’s going to happen when you’re playing with power. Power draws other powerful people to you and then it can corrupt you. You can be powerful evil or you can try to use your power for good, but to do that you have to learn to be selfless. So they are going to learn a lot of the same lessons. What matters most are the choices they make along the way. There is a lot of things we’ve done, certain tropes in Star Wars we’re now trying to avoid as far as types of kids and where they come from. What’s great is there’s a whole host of stories we haven’t told yet about different kinds of kids with different experiences growing up maybe to learn to use the Force, maybe not. I’ve always just wanted to do a show just purely about pilots because I thought the pilots to me as a kid were such a powerful moment in A New Hope and they seem to be using the Force whether they knew it or not to be doing these amazing acrobatics in their ships. I think there’s an endless stream of ideas we can do in Star Wars and like I said, the trick is really picking which ones get made and which ones don’t. You hope you pick the good ones. Well, if season 2 is any indication Dave and the folks whose time and talent bring these episodes to us every week have picked some really good ones indeed. Read part 2 of our interview right now! Previous Previous post: LEGO Releases All-New Disney Minifigure Line!